The purpose of this Type Study is to describe the subtle variations and differences in the Emmert patternmaker's vise. While the Emmert Mfg. Co. produced a number of fine well crafted work holding devices, the type study described here is limited to the large and handsome No. 1 Patternmakers vise or Universal vise. The smaller yet very capable No. 2 model is similar and can be seen on the Small Emmert Photos page. Other models such as the Machinist No. 4a and 6a can be seen on the Other Emmert Vises page. 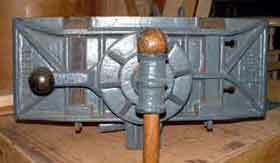 The Emmert patternmakers vise has the ability to hold the work piece and then rotate on the axis of the screw or hub. This finely crafted vise can also tilt the work piece upright using its unique hinge mounting angle so that the work piece is held parallel to the top of the bench. 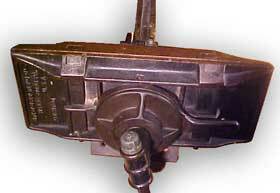 The tilt action is locked in place by the tilt adjustment lever and tilt lever bracket. These parts mount to the underside of the bench or to the bench leg. Often the tilt adjustment lever and tilt bracket are missing when purchasing an Emmert vise having been left behind when removing. Also these parts are often mismatched with other Emmerts or Yost parts as they are replace with what ever is available. The Tilt Adjustment are described in a separate section. The No. 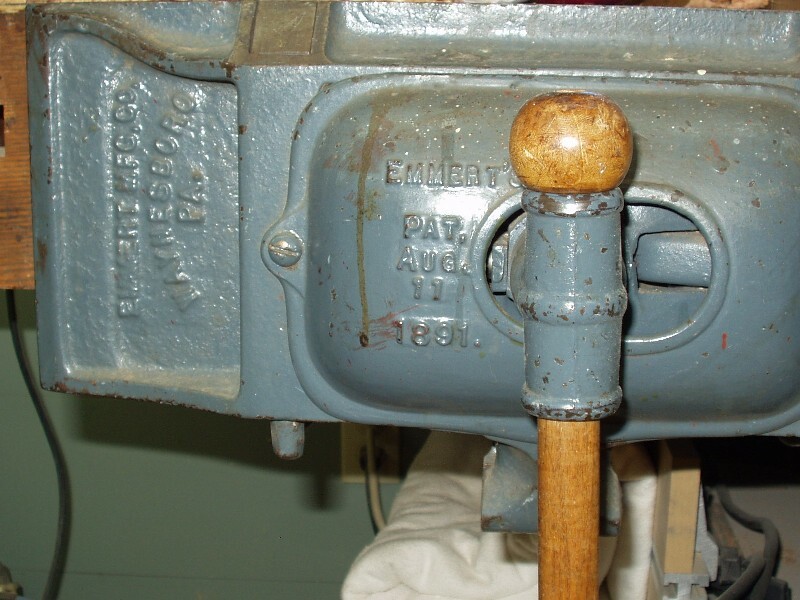 1 cast iron vise weighs a massive 86 lbs and has 7" x 18" jaws which open 14 inches. The Numbering System. Emmert patternmaker's vises fall in two main categories. 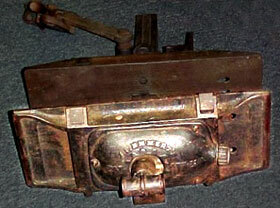 They are commonly called the Turtleback and the K1 or "New Improved" Universal vise. For years both of these main types were sold at the same time. Both were called No. 1 Universal Vises. So to avoid confusion, the numbering system is divided between T for Turtleback and U for the "new improved" Universal. I did not want to use the "K" in the type numbering since that would be confused with the "K" in the casting numbers. See Emmert Anatomy for more information on the casting numbers. I considered using dates in the numbering system. Finding dates of manufacture proved to be too difficult. I could not find anyone to sell or loan me an Emmert Catalog. Other tool catalogs often did not match the products being sold. For instance, one ad in a 1913 tool catalog shows a Turtleback with one patent date. The second patent was approved in April 1905 (6 years earlier). For these reasons, I have chosen to use a linear numbering system. If additional types are found, I (and I hope those who come after me) will add a decimal point and number after the original numbers. This will allow the original Type U3 to remain after the Type U1.5 or Type U0.5 is uncovered. The Turtleback name comes from the shape of the cover on the front jaw. Click on the picture to see additional photos of that type. Move cursor over the picture to highlight features. Turtleback with One patent date, geared symbol around spindle hole, no text on front jaw. Cover has a gear symbol around spindle hole, and J. F. Emmert's arched on above, Pat. Aug. 11 in middle and 1891 Waynesboro PA. on below (Logo1). Cover gently sweeps towards taper adjustment. 3 round head slotted machine bolts hold the cover on. Front Jaw does not have a casting number or text. Vise Dogs 4 dogs, 2 flat top on rear jaw and 2 angled top on front jaw. They are made of cast iron and break easily. Taper Adjustment is round knob with short stem. Hub has a casting number of 14 (Hub1). Beam has slot on side. Tilt Adj. Mechanism is flat bar with notches (TA1). The vise will rotate 360 degrees and lock in 45 deg. increments. Type T1 may have a serial number stamped on it. Click Here. This is a uncommon type. Turtleback with One patent date, no gear symbol, no text on front jaw. Cover has Emmert's arched over spindle hole, and Pat. Aug. 11 91 (Logo2). Cover is more rounded at taper adjustment. Front Jaw has no casting number or text. Beam has slot on right side. Tilt Adj. Mechanism is a round bar (TA2). Type T2 probably has a serial number stamped on it. Click Here. 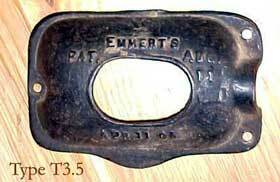 Turtleback with One patent date, no gear symbol, front jaw has 82 on right and usual Emmert text on left. Cover is same as T2 (Logo2). Front Jaw has 82 casting number on right side and Emmert Mfg. Co. Waynesboro (arched) PA. USA on left side (Logo4). Taper Adjustment is round knob with a short stem. Type T3 probably has a serial number stamped on it. Click Here. This is an uncommon type. Turtleback with One patent date, elongated spindle hole, front jaw has 82 on right and usual Emmert text on left. Cover has Emmert's straight over spindle hole, and Pat. Aug. 11 1891 (Logo3). Spindle hole is oval shaped and much larger like the Type T4. This allows the cover to be removed without removing the spindle. 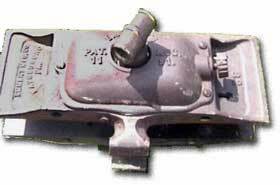 Front Jaw has 82 (horizontal or vertical or under the cover) or 2 casting number on right side and Emmert Mfg. Co. Waynesboro (arched) PA.USA (Logo4) or without USA (Logo3.7) on the left side. Taper Adjustment is round knob with short or long stem. Turtleback with Two patent dates but 1891 scratched off, elongated spindle hole, front jaw has 82 on right and usual Emmert text on left. Cover has Emmert's straight (not arched) over spindle hole, and Pat. Aug. 11 (Logo3.5). Spindle hole is oval shaped and much larger like the Type T4. This allows the cover to be removed without removing the spindle. Below the spindle hole reads Apr. 11 05. I gave this one a separate Type number because the cover is one of the main distinguishing elements. This cover might be an odd and unusual casting. It appears that the 1891 was scratched prior to casting the part. Turtleback with Two patent dates, elongated spindle hole, front jaw has 82 on right and usual Emmert text on left. Cover has two Patent dates (Pat. Aug 11, 1891 & Apr. 11, '05) and says Emmert's above and USA below (Logo3). Spindle hole is oval shaped. Vise Dogs 4 dogs, very delicate. Turtleback with Two patent dates, elongated spindle hole, front jaw has 82 on left side now with nothing on right. Cover is same as Type T4 (Logo3). Front Jaw has casting number 82 on left side. Taper Adjustment is round knob with long stem (usually). The "New Improved" Universal types are sometimes called "K1" because of the casting number on the front jaw. Casting numbers are part numbers used to aid in assembly of the vise. Click on the picture to see additional photos of that type. K1 Universal with short vise dogs, no cam, and high-low ribbed collar. 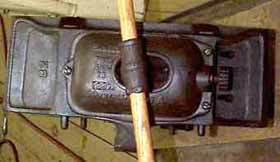 Why include a Victor Tool Co. vise and where did it come from? ... 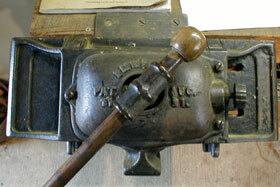 This late comer to the Emmert Type Study is the earliest known "K1" universal vise. The first photos were sent to me from a fine gentleman in the highlands of Scotland. 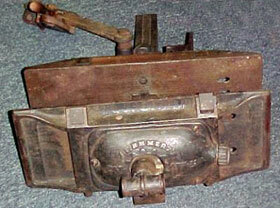 The "New Improved" or "K1" vise that we all know and love was originally patented by Victor R. Koontz. The patent was filed on Feb. 6, 1918 and granted on July 15, 1919. 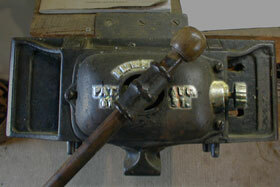 This rare and unique vise had a short production run between these dates and was then changed to carry Emmert's name. Collar has 8 reinforcing ribs, half low or triangular shaped and half high fin, almost rectangular shaped. Front Jaw has Victor Tool Co. Waynesboro PA and "PAT APLD FOR" (Logo4.5) or "PATENTED" (Logo4.7) on left side and K1 on the right. Extra bosses are cast to receive the bolts used to adjust the taper adjustment. Rear Jaw has no casting number. Vise Dogs are short on front and rear jaws and do not protrude thru the lower jaw casting. Taper Adjustment is accomplished by loosening the collar, adjusting 2 thumb screws and re-tightening the collar. Hub is long hub with equal sided casting at split (Hub2). Beam has slot on right side. Beam can be installed with slot on left side. Tilt Adj. 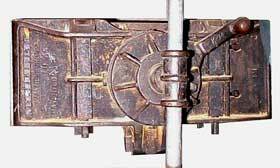 Mechanism is a flat slotted bar (TA3). This is a rare type. Collar has high-low ribbed collar. 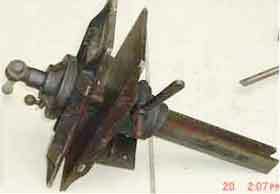 8 reinforcing ribs or gussets, half triangular shaped (low) and half almost rectangular shaped (high). Front Jaw has Emmert Mfg. Co. Waynesboro PA U.S.A. and Patented (Logo5) on left side and K1 on the right. The drawing shows an extra horizontal rib extending to the outer edge of the front jaw but actual vise does not. Extra bosses are cast to receive the bolts used to adjust the taper adjustment. Vertical rib near collar is missing. Taper Adjustment is not by use of a rotating cam. You adjust finger screws on either side, just behind the collar. K1 Universal with long vise dogs, with cam added, and high-low ribbed collar. Front Jaw has Emmert Mfg. Co. Waynesboro PA U.S.A. and Patented (Logo5) on left side and K1 on the right. Vertical rib near collar is missing. Taper Adjustment now uses a cam with a handle and knob just behind the collar. The knob is easily broken off. K1 Universal added vertical rib on front jaw behind collar. Collar has 4 reinforcing ribs, all triangular shaped. Front Jaw has Emmert Mfg. Co. Waynesboro PA U.S.A. and Patented (Logo5) on left side and K1 on the right. Vertical rib near collar added. Taper Adjustment uses a cam with a handle and knob just behind the collar. K1 Universal with 4 rib collar. Front Jaw has Emmert Mfg. Co. Waynesboro PA U.S.A. and Patented (Logo6) on left side and K1 on the right. Vertical rib near collar added. Hub changed to short hub with unequal sided casting at split (Hub3). K1 Universal added extra reinforcement at base of vise dogs and now has the standard 8 rib triangular fin collar. Collar has 8 reinforcing ribs, all triangular shaped. Front Jaw has Emmert Mfg. Co. Waynesboro PA U.S.A. and Patented (Logo6) on left side and K1 on the right. Extra reinforcement at base of dogs added. 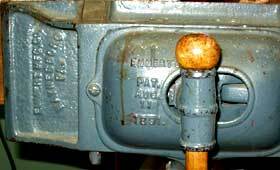 Taper Adjustment uses a cam with a handle and knob just behind the collar and casting number K-14. Hub is short hub with unequal sided casting at split (Hub3). Tilt Adj. Mechanism is a flat slotted bar (TA3) or flat solid bar (TA4). 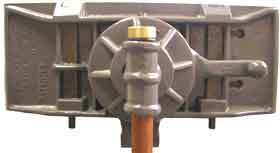 This is the most common "New Improved" Universal Type. K1 Universal added extra V shaped reinforcement on jaws and now has a plastic knob on the cam. 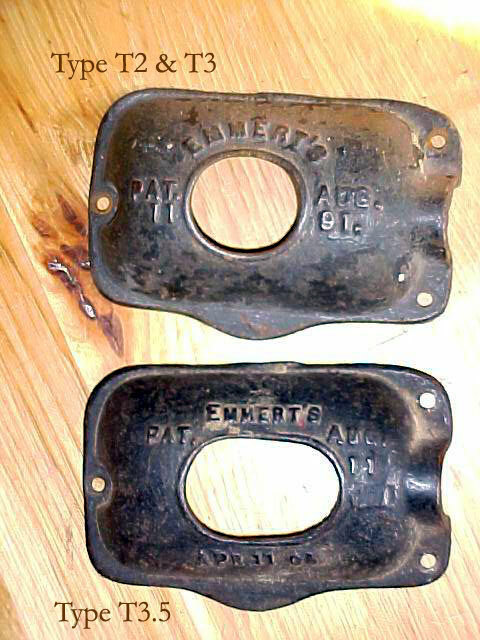 Front Jaw has Emmert Mfg Co on left side and K-1 Waynesboro PA USA (Logo7) on the right. Extra reinforcement at base of dogs. Extra V shaped ribs on jaws for more reinforcement added. Rear Jaw has casting number K-2 and V shaped reinforcing ribs. Taper Adjustment uses a cam with a handle and a new plastic knob just behind the collar and casting number K-14. Tilt Adj. 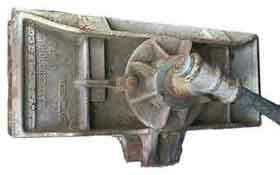 Mechanism is a solid flat bar (TA4).